The Gateway of India, one of the majestic landmarks and the most photographed monument in Mumbai city, was built to commemorate the visit of King George V and Queen Mary to India in 1911. But the construction was completed only years later after their visit. The last British unit to leave India after it received Independence on August 1947, the Somerset Light Infantry, marched through the Gateway on 28th February 1948, after taking part in a huge ceremonial Parade. A magnificent silver replica of the Gateway of India was presented by the Army of India to the battalion. The Gateway of India, located facing the harbour of Mumbai, at the tip of the Apollo Bunder in the Colaba area in South Mumbai, gives a magnificent view of the Arabian sea. Formerly, this colonial historical structure, welcomed numerous Viceroys, Governors and top civil servants to India. 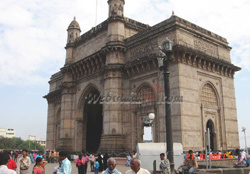 Today the domed basalt Archway serves as Mumbai's major tourist center. The foundation of the Gateway of India was laid down in March 31, 1911 by the then Governor of Bombay, Sir George Sydenham Clarke. Designed by George Wittet, a Scotland architect, it's construction was completed in 1924 AD and was opened to the public on December 4, 1924 by the Viceroy, the Earl of Reading. Built in Indo-Saracenic style, the gateway has elements of 16th century Muslim style of Gujarat, and is made of yellow Kharodi basalt and reinforced concrete. The gateway has four towers and intricate latticework engraved on the basalt. The central dome is 15 meters in diameter and 26 meters to its apex. The total cost of the Gateway's construction was Rs. 21 lakhs which was borne mainly by the Indian Government. The whole harbour front was realigned to come in line with a planned esplanade which was never built, due to a lack of funds, and so the Gateway now stands at a curious angle to the road leading up to it. There is a lawn in front, where people can relax and watch hundreds of pigeons that flock together. The place is also a famous Film shooting location. A beautiful statue of the Maratha leader Shivaji, sitting on his horse, erected in 1960, and a statue of the social reformer Swami Vivekananda, stand nearby. Just Behind the gateway, there are steps leading down to the water. Always crowded, here boating facility is available. One can hire little motor boats, for a short cruise through Mumbai's splendid natural harbour, and for trips to the famous Elephanta Caves. Boats leave from the Gateway all day.